I recently returned from a long weekend trip to Los Angeles, a city that I've been visiting for nearly as long as I can remember! At some point in my childhood, my Korean family started to gather in the city after departing Queens, NY (my uncle in the early 90s, my grandparents a year or so before 9/11) because there is a healthy Koreatown in LA. So when my lil bro (cousin) was graduating from high school, and my grandfather was celebrating his 90th birthday, I had to make the trip to Cali. For the first day or so, I was blessed to find a home-away-from-home with my friends SH and JH. SH and I knew each other from college, and JH have forged a long-standing relationship on social media where we share a lot of mutual friends. Getting to spend time with her was so natural... it's like we've known each other for ages! They're both brilliant people and I was so lucky to get some time with them. We kicked off our first night with pizza at Grimaldi's, which definitely tasted delicious after my long flight. Then the next day, JH and I went out for a walk around the Hollywood reservoir for a great view of the sign! JH is the perfect hostess, and she knew that I love foodie fun. So when she heard I had Seoul Sausage Company on my wishlist, we headed to Studio City where a number of food trucks were parked for lunch. OMG! I pretended I was a network executive and loaded up on Korean fusion foods. JH ordered the Galbi Poutine from Seoul Sausage Co., 8 hr. braised short ribs served on top of twice fried french fries with cheese, kimchi pickled onions and avocado lime crema. It was amazing! 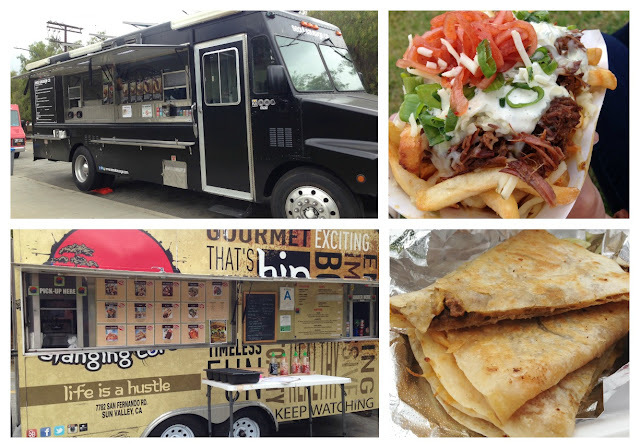 I ordered the OG (Kalbi) Quesadilla from Slanging Corea, which was tasty too! But my favorite dish was the Flaming Ball from Seoul Sausage Co. 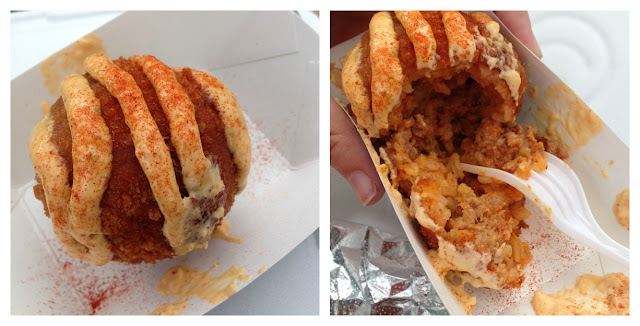 The Flaming Ball is a cheesy kimchi fried rice ball with spicy pork served with their DMZ sauce, a garlic jalapeno kimchi sriracha aioli. AMAZING!!! After lunch, we headed to Tea Pop for some boba. I had my own idea that I didn't like boba, because of a non-yummy bubble tea I once had. But this visit to Tea Pop sent me on a boba train the entire weekend, drinking milk tea with boba every chance I could get it! Even more awesome, they spelled our names right. I had the Salted Caramel and it was so refreshing. 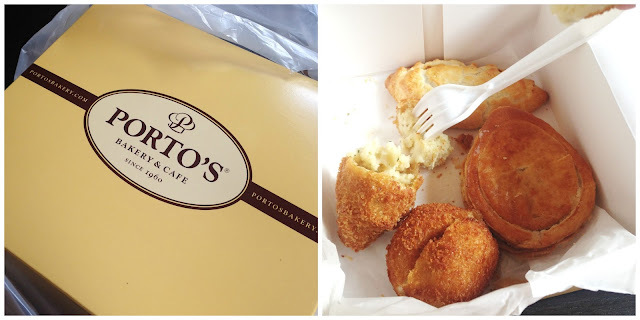 I was eating the same number of meals/snacks as a hobbit, so JH insisted we stop at Porto's for some Cuban pastries, both savory and sweet. We shared little bites of every pastry, like a tasting, so we wouldn't spoil our dinner. We had meat pie, croquettes, a potato ball, and a sweet pastry. Dinner was EPIC. Since JH is Taiwanese, and I'd never officially had Taiwanese food, I was treated to a feast for dinner at Din Tai Fung. She ordered everything, so I didn't have to do any work at all! 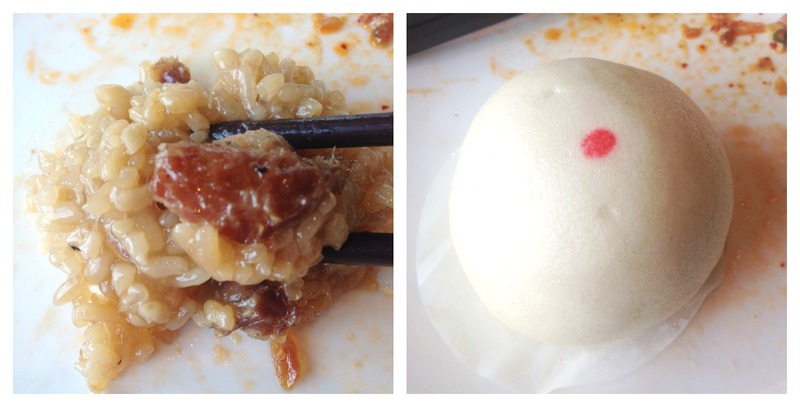 We had Pork XiaoLongBao steamed dumplings, Noodles with Minced Pork Sauce, Vegetables and Pork Wontons with Spicy Sauce, Tofu Puff and Glass Noodle Soup, Pork Sticky Rice, and Sweet Taro Buns for dessert. OMG. I wasn't well-versed in eating these broth-filled bao, and I definitely party-fouled and squirted juice all down the front of my dress. But I kept eating! They were probably my favorite dish of the night. But in truth, I loved EVERYTHING and ate EVERYTHING. The pork sticky rice was the most surprising to me; I couldn't figure out what made it so sticky, and it was soooo good! I can't even describe the tacky consistency, and I'd love to have it again someday. 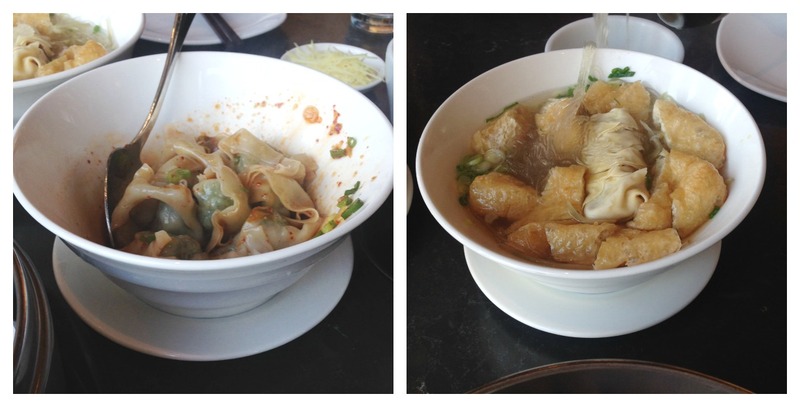 Taiwanese food is delicious. I must say I was glad I packed forgiving dresses for the trip, because a waistband would have held me back. Let's just say I undid ANY weight loss/fitness progress I'd made over the four full days of eating I spent in LA. I'm so glad JH was able to take me to so many incredible places during my first full day in town!!! P.S. 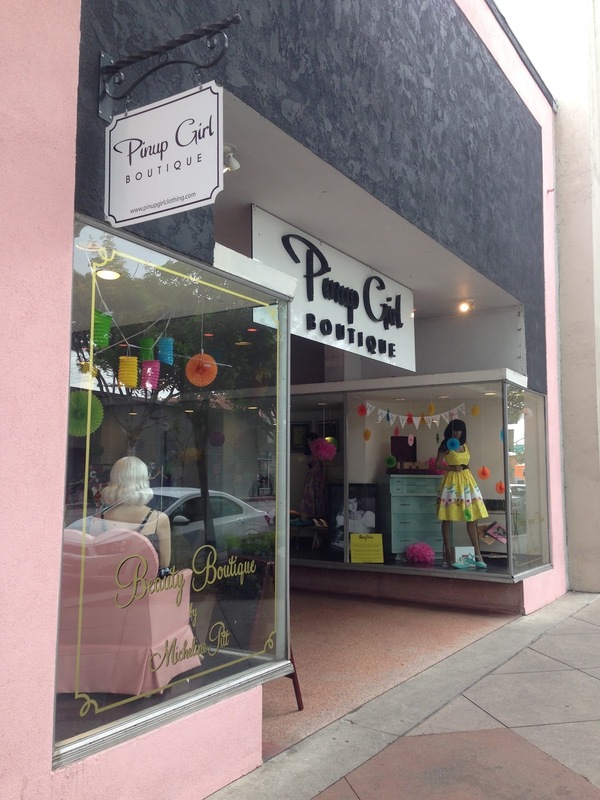 When we were headed to Porto's I saw that we were *right next to Pinup Girl Boutique*! I went inside and tried on a skirt. So cool to see the flagship store in person, completely by accident. And now I know my size in their clothing!